Last night I made some chunky marinara sauce for pasta. If I do say so, it was delish. Well, there was left over. Today while at work, I was trying to be creative about dinner and nothing was working. 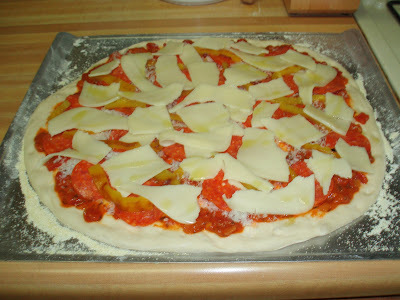 On my way to the grocery store, I thought I'd try to use up the sauce...so pizza? 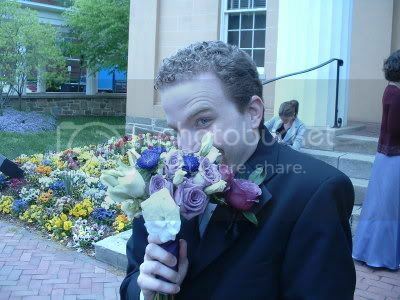 Well, my initial plan was to use one of this pre-done crusts that my store has. BUT!!! They actually had packages of fresh dough! Wahoo. 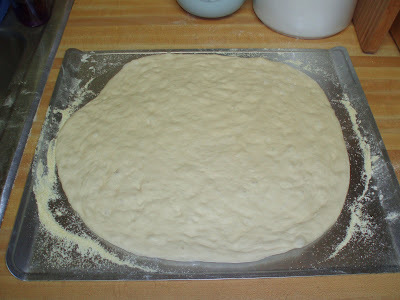 Stretched out dough, on a pan dusted with cornmeal, so I can slide the pie onto my baking stone in the oven. 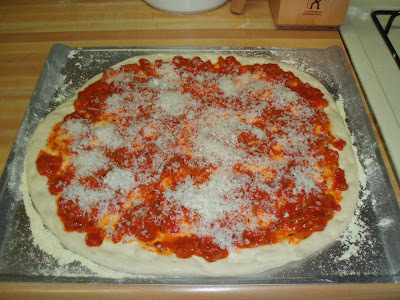 Sauced and sprinkled with some parmigiano reggiano! 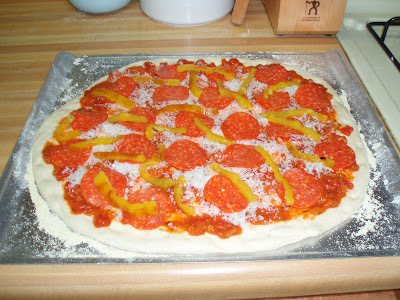 Pepperonis and roasted bell peppers. Cheese and a drizzle of olive oil. Finished!!!! About 16 minutes in a 450 degree oven. This was a very satisfying. The crust was great. The toppiings were complementary and the leftover sauce worked great. A little salt would have elevated this to near perfection, as far as I'm concerned. 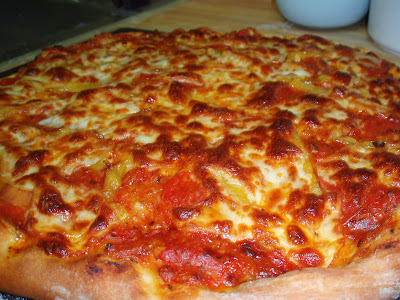 Wow, that looks bubbly and hot and delicious! my god that looks so good! you cook dinner like, almost every night! i am shocked by your prodigious output!